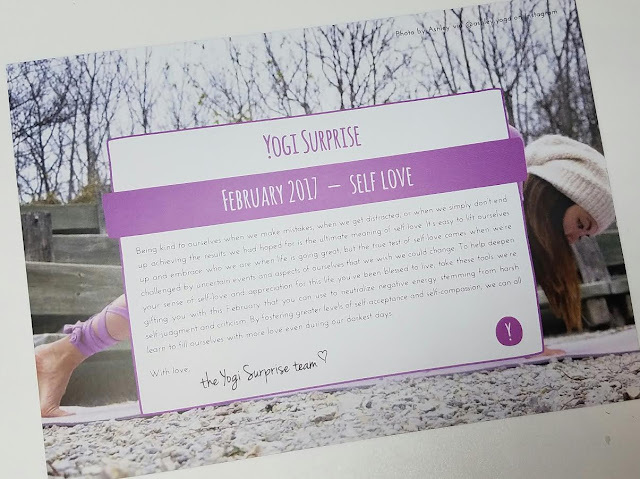 Yogi Surprise is a box that focuses on products that will integrate into a yoga lifestyle. I don't really do yoga but this box has had some fun things in it. So I signed up with a coupon to get a taste. So far it's been great. This month has a little too much lavender in it and I checked my account to see if I could skip it but no such luck. I wish every subscription allowed that. The theme is "Self-Love" and if loving yourself has to do with smelling like lavender and being clean, you got the right box. Haha! 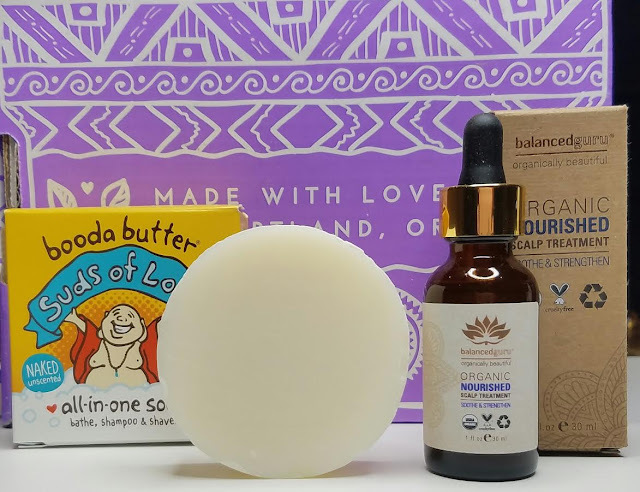 What You Get: You’ll receive 6 to 8 full-size products with a value of over $70, designed to nourish and support your well-being, vitality, and growth. Booda Butter Suds of Love- This is an unscented soap made of Shea Butter, Coconut Oil and Olive Oil. You can use it for just about anything. It's a nice white and smells exactly like nothing at all. I'm just gonna give a little shout-out because this company is from a little bit north of me! Yay, Booda Butter from Bellingham! BalancedGuru Organic Nourished Scalp Treatment- This is basically aloe, alcohol and essential oils (yes, including lavender). I'm not sure I really want to rub this on my scalp-- oh, wait, I can't. I hate not having the option. *shakes fist at lavender* I can't tell if I think the alcohol would be good because I have an oily scalp or if the essential oils would make it more oily. Aloe is always a good thing (in my opinion). 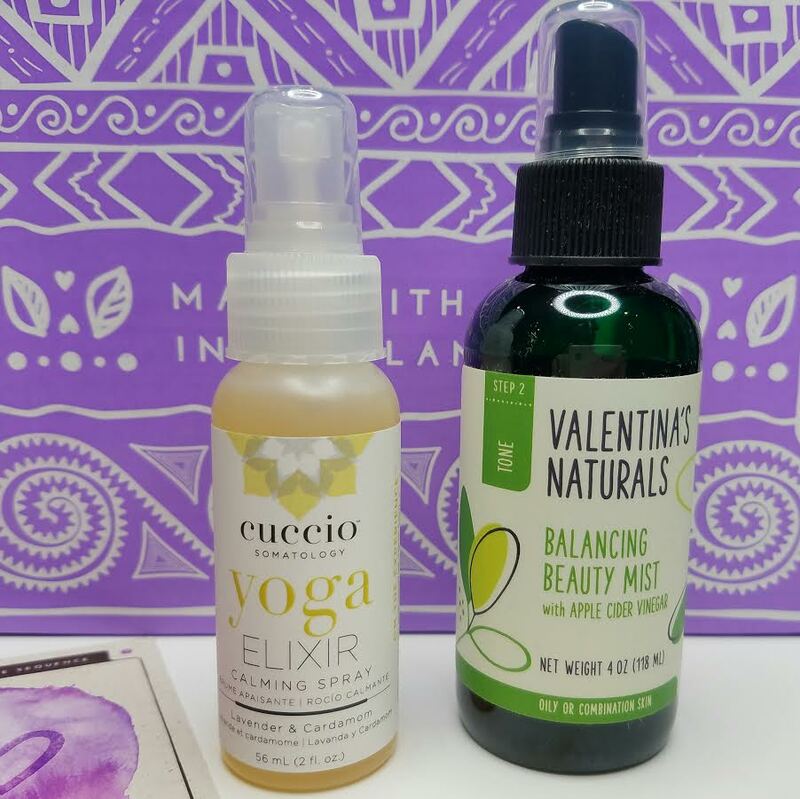 Cuccio Somatology Yoga Elixir Calming Spray- This is mad with Lavender and Cardamom which I'm sure smells absolutley wonderful. I was so happy to see cardamom and so sad to see lavender. Ugh. I hate allergies. This spray is good for anything from rooms to wet towels. Bearded Brothers Blueberry Vanilla Energy Bar- Made with dates, real dried blueberries and almonds without added oils or sweetener. This bar has a bit of added protein from organic sprouted brown rice powder. 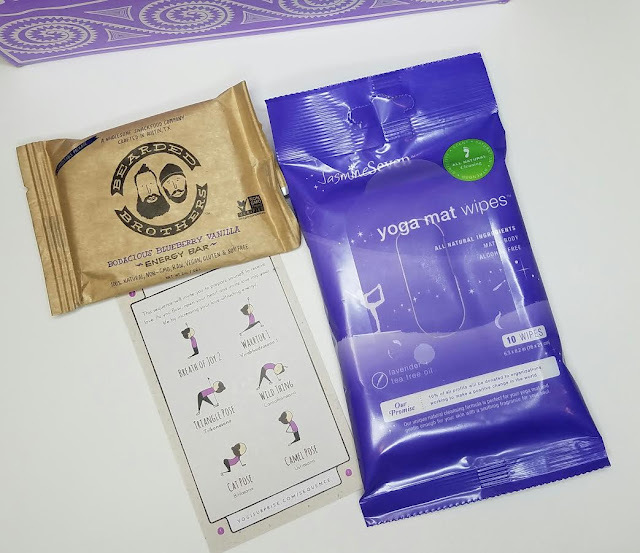 JasmineSeven Yoga Mat Wipes in (you guessed it!) Lavender + Tea Tree Oil- Keep your mat clean! Or your skin. Or whatever! This brand has some peppermint foot wipes that I adore. VERDICT: Well, I have to admit that for me specifically this box is a flop. I can't breathe lavender, I don't like dates and I have dry skin so I can't even use most of these products. HOWEVER!! I am well-aware that boxes of this type have a lot of lavender (hence subscribing with a coupon) so it's a risk I took knowingly. Besides that, the variety is great, the brands are fun and eco-friendly and really if you want a date with yourself, you could use all of these. Oh, and the value is incredible! If you would like to subscribe to Yogi Surprise, you can do that here. 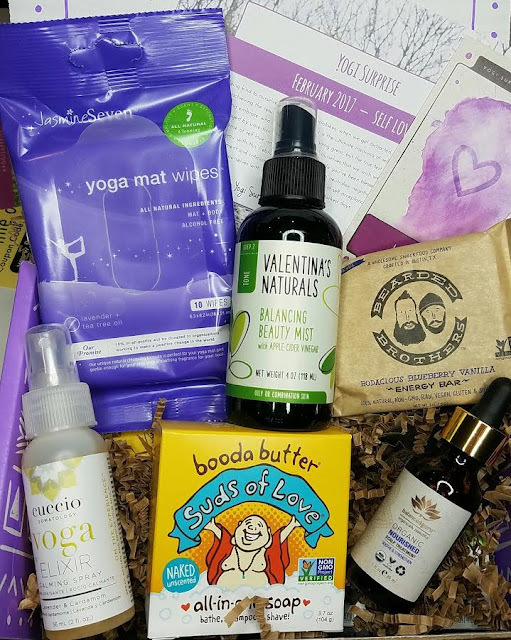 Use code YOGILOVE for 20% off your first box. 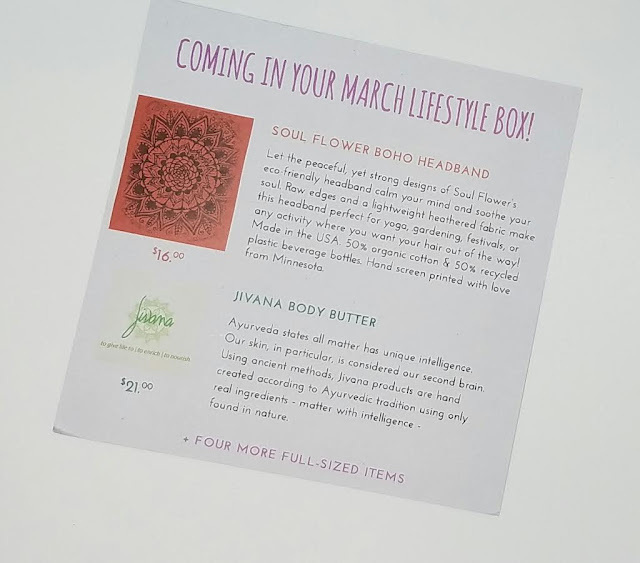 Soul Flower Boho Headband and Jivana Body Butter! You'll get these two things plus four more items and the always included yoga pose card. What do you think!? Fun? Would something like this be great for someone who does love yoga?